In case you forgot, Valentine’s Day is right around the corner. I subscribe to damn near everything so I couldn’t forget as I’m receiving daily reminders. 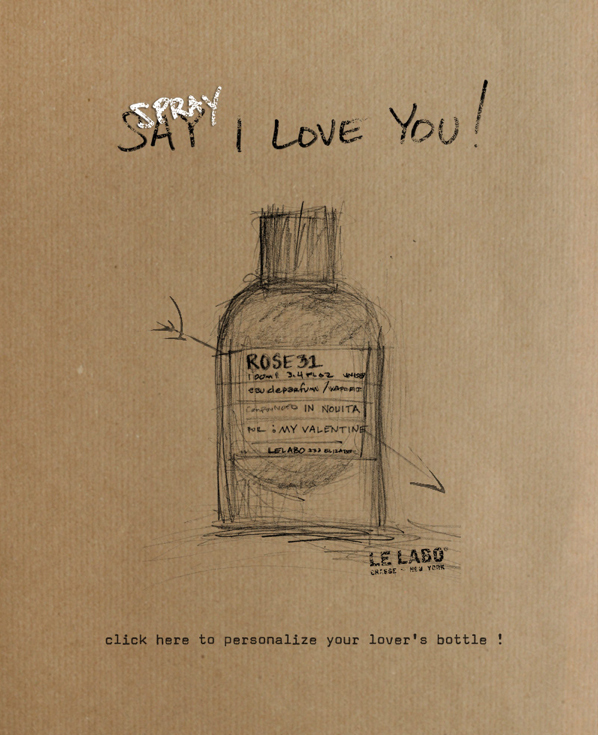 A pleasant tap on the shoulder just came in from Le Labo, featuring one of my favorite scents, Rose 31. I just loved the graphic and decided to share. If you haven’t already tried this magnificent scent, why not treat yourself this Valentine’s Day. I think you’ll love it. It’s not girly either (although there’s nothing wrong with that). And if you’re curious as to why I’m so in love with this one, click here. This entry was posted in Uncategorized and tagged Le Labo, Men's Colgone, Men's Fragrances, Men's Scents, Rose 31, Rose scents, Valentine's Day. Bookmark the permalink. Darn. I was just at Le Labo, and thought I smelled everything, but I don’t remember this one… I do remember their Patchouli and Oud, though. Loved those! Le Labo is a definitely must stop shop everytime we’re in NYC. We tried to get their special edition candle at the Gramercy Park Hotel, but the $150 price point stopped us in our tracks. I shell out a lot for candles, but could not justify that price when it’s just about the same as the ones they sell in their shop for 1/2 the price. Great fragrance, though! Somehow I missed that special edition candle. I’ll have to look into that. Thanks for sharing. Tried this one and hated it. Have to revisit. Rose 31 has been a favorite of mine for years.